Check out this nifty device called Instrument 1, which seeks to be a new way to play music – by being multiple instruments at once! By thinking outside of the box in terms of physical input methods – pressing, strumming tapping, bowing – Instrument 1’s creators could be onto something pretty creative! 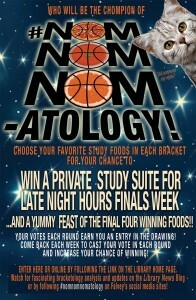 The first round of #NomNomNomatology has begun! Be sure to vote for the winningest foods in some intensely delicious match-ups right here, or vote in person at the front desk in Falvey!